An artist has to have a certain level of accomplishment behind them before attempting anything as audacious as a "rock opera". No one's debut album is such. Though it was before the formation of Yeasayer when Anand Wilder dreamt up Break Line with friend Maxwell Kardon, he was wise to wait until he had charmed and startled the world with three albums with that band (two mesmerising, one passable) before devoting his focus to this. It was similar with Fucked Up's David Comes To Life and The Flaming Lips' Yoshimi Battles The Pink Robots, both bands enjoying a solid following and critical traction before turning to such an idea. 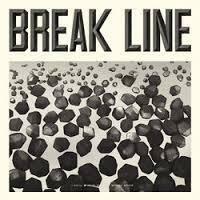 It seems odd to call Break Line a rock opera, however many of the associated histrionics and operatic hyperbole are nothing more than out of date assumptions. This is mostly thoughtful, understated and abstract, and doesn't deal with grand questions of love and faith. Refreshingly, Break Line's storyline is secondary to setting, generation, community and ideology. Ever since Yeasayer's debut All Hour Cymbals, I've wondered what an Anand Wilder solo album would sound like. A deeply enigmatic musician, he seems the fulcrum around which the trio's sound revolves live, and a lot of the their best songs - such as 'A Madder Red', 'Strange Reunions' and 'Blue Paper' - have him as their driving force and singer. This obviously is not that album, but it is at least a sign of the directions his tastes move towards when outside the Yeasayer context, and this one clearly means a lot to him: Break Line has been gestating since 2004. And let's not pretend: though accomplished pianist and composer Maxwell Kardon is a full partner in the project and on some songs, it sounds like, the principal songwriter, it is the weight that Wilder carries that allows the album such a profile (a Google search yields pretty much nothing on Kardon outside of this release). Anyone expecting the colourful and eclectic experimentation of Yeasayer will be disappointed, indeed this is even fairly conservative musically, compared to Tommy, and makes SF Sorrow sound like a mad, kaleidoscopic fairytale. The duo's basic approach is encapsulated on 'Wedding Day', one of two songs released online ahead of the album, where Wilder takes vocal duties on a pleasant, pastoral little thing that leads to ebullient recorders and primitive percussion that wouldn't be out of place on The Incredible String Band's first album. The insistence on accessibility also leads to some breathy, anthemic choruses, with the duo citing Celine Dion as an inspiration, and this makes for the record's only real dud, 'Hold You Tight', sung by Caroline Polachek of Chairlift, under the pseudonym Tanya Houndsley. This is rather too saccharine and homely, which granted is entirely the intention, but while it may play a role in the story it is, without doubt, a track to skip. It takes a few listens to glean any inkling of plot. An industrial mining dispute in small-town Pennsylvania in the 50s is the setting, with a central figure pitted against the onslaught of big business interests as well as the caving-in of his fellow workers, eventually provoked to what sounds like terrorism on 'They're Stealing Our Coal'. The last quarter of the album sees him coming to terms with his actions, and his punishment. And to reflect the drama and issues, the songs lurch in style from balladry to protest songs (the actually very convincing 'Better To Die'), fairly conventional Americana and even glam. The only track that sounds like it could be realistically belted out on stage, Chicago-style, is 'Opportunity', sung by the immediately recognisable Chris Keating of Yeasayer with his familiar gusto, and indeed it something of a shame his dramatic, piercing style doesn't feature more. That song features some fairly conventional rock opera/musicals formula; from Frank Loesser to Leonard Bernstein, the trick of a small, almost casual opening extending to a large ensemble crescendo almost always kills, and indeed there is a gospel choir on hand to give this track an amusing Broadway feel. The trick is also pulled off on 'Hang Your Head High', the closing track that offers the sad execution of the narrative's anti-hero (do spoiler alerts apply when reviewing rock operas?). The song features the best vocal cut on Break Line, from Dekle, who along with some impressively overblown guitar work brings a fitting denouement to such an ambitious and absorbing project, which is, unusually for such a thing, quite short at around 40 minutes. It is interesting to note that both David Comes To Life and Break Line have as their central premise issues of disgruntled labourers or union uprisings, with elements of violence thrown in, in the 80s and pre-WWI respectively. The likes of Tommy, Quadrophenia and SF Sorrow are more the tales of individuals, though they too offer a certain degree of social commentary. Is, therefore, the "rock opera" an increasingly viable option for musicians wanting to explore today's socio-economic melee?